Kids' Book Review: Review: Where is the Very Hungry Caterpillar? Review: Where is the Very Hungry Caterpillar? The Very Hungry Caterpillar has to be one of the all-time great classic picture books. I’ll happily buy any of Eric Carle's wonderful work and this new lift-the-flap board book for toddlers is just gorgeous! I have to admit this is the sixth addition to my Very Hungry Caterpillar book collection. I have all the variations from press button noisy books, touch and play books, board books and, of course, the classic picture book. Despite my already extensive caterpillar collection, this one was a welcome new addition. Toddlers love to be involved in books, so anything with flaps that they can touch and explore is going to be popular. 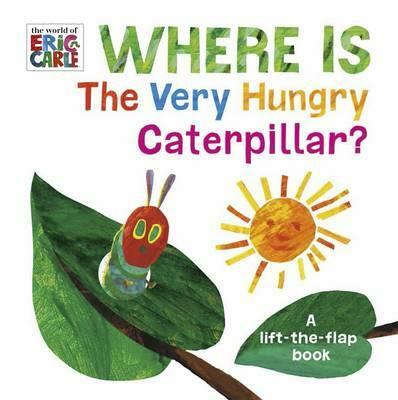 This is a simple look-and-find book where little people can search for the caterpillar on each page by lifting flaps. The solid board book construction makes it reasonably toddler proof and flaps are large and easy to open. Each page involves searching for the very hungry caterpillar under a large flap, which reveals a different creature hiding on each page. Eg ‘Is he munching the cake? ', ‘No, that’s a squeaky mouse!’. The book is also great for guiding toddlers with colour recognition as Eric Carle's bright bold illustrations focus on a main colour theme on each page. For example, in ‘Is he nibbling the strawberry?’, the word ‘strawberry’ is in large red letters and the strawberry itself (the flap and focal point of the page) is, of course, red (and there are a few scattered cherries too!). This is a lovely little book for you and your toddler to explore. Together you can open flaps, discuss colours, delight in the vibrant illustrations and try to find that cheeky caterpillar! This is another beautiful offering from the world of Eric Carle and a wonderful way for young caterpillar fans to engage with their favourite caterpillar in a new way. Keep those caterpillars coming Eric Carle! Title: Where is the Very Hungry Caterpillar?